We know it sounds 'corny' but we truly mean it: Your satisfaction is our aim! In keeping with this claim we decided to make our prices dependent on your satisfaction. When you book one of our tours you get the so-called Fair Price. We call this price Fair Price because it represents all our efforts to realise your cycling holiday. Since we have expenses in advance, we think it reasonable to expect a 50% deposit based on the Fair Price. After completing the tour we send the final invoice covering the remaining 50%. You then get the possibility of honouring our services by paying more or less, depending on your satisfaction with our services. We know that we are probably the only tour operator doing it this way and that it may sound rather risky. However, in the past no guest has ever paid less than what we originally asked for. Some have even paid more. But that's definitely not a must. If you prefer to pay in any currency different from £ or €, please contact us and ask for a quote. 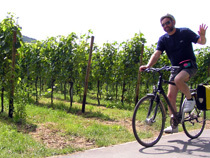 We are happy to welcome guests from all over the world on our guided cycling holidays.